VOCABULARY quiz: Learn a word's meaning by matching images or definitions with the word. Spelling tutoring is an optional add-on for premium users. 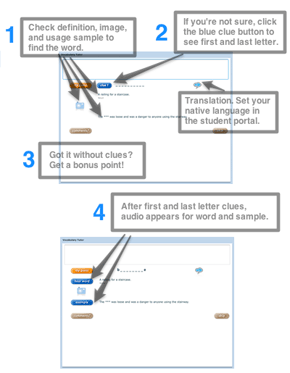 More details under step 3, vocabulary quiz. 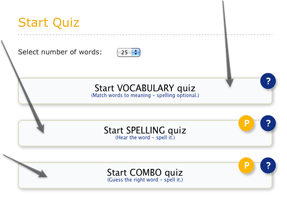 SPELLING quiz: Listen to the word, review the definition and sample sentence, then spell it. The preferred mode for Spelling Bee champions or if you want to focus on spelling. COMBO quiz: Can you guess the right word based on definition and letter count?